These are the words San Francisco artist Heather Day wrote in a proposal letter to Facebook, where she hoped to combine her art with Facebook’s Augmented Reality (AR) technology. She never sent the letter, but in a serendipitous twist, Facebook contacted her weeks later with a proposal of their own: an AR art project for our Menlo Park headquarters. Imagine watching extinct animals or dragons stroll by at your local park. Or opening a portal in your room, transforming it into a bustling cityscape with your walls suddenly covered in graffiti. Scenarios like these are no longer fantasy or science fiction. Instead, they’re examples of what’s possible — on your smartphone — through the power of augmented reality. To do this, we need to build a map of the surrounding environment as it’s being explored in real time. While doing that, we also need to accurately estimate the position and orientation of your phone’s camera with respect to that map. This ability to place and lock in digital objects relative to real-world objects is known as simultaneous localization and mapping (SLAM), and it’s an ongoing challenge in computer vision and robotics research. Our SLAM library integrates features from multiple systems (ORB-SLAM, SVO, and LSD SLAM), but what really sets it apart is the library’s performance optimization, down to the very last instruction. Having a SLAM system capable of running at 60 Hz on mobile devices is hard: every 16 milliseconds, your phone has to capture an image, find hundreds of interesting key points, match them with the same points in the previous frame, and then use trigonometry to determine where each of these points is in 3D space. Since there is so much going on, we needed to do lots of fine-grained optimization and rethinking of how these algorithms operate. The AML team worked with Heather to determine which images should be given to the animators, and what movements they should make in the living, breathing AR installation. 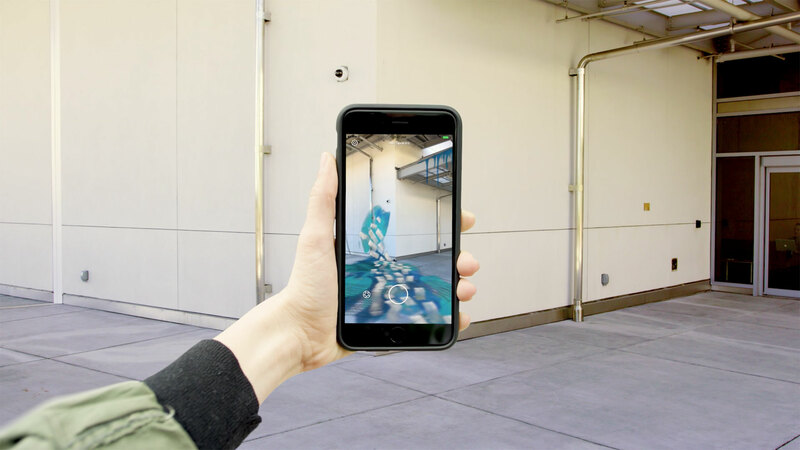 Within two weeks, they built technology that would recognize the specific location for the art and analyze the scene geometry that made Heather’s virtual installation stick to real surfaces. At our F8 developer conference this year, the audience saw Heather’s art come to life with rhythm as it flowed off the walls and onto the ground like a waterfall. Through SLAM technology, and her creative expertise, we erased the boundaries between virtual and real—between science and art—and in the process gave a glimpse into how technology and art can be intertwined. This is our vision of enriching everyday life with the possibilities of the virtual, digital ecosphere. AR gives us endless ways to engage with and experience the world. While we’ve come incredibly far in improving AR technology, there’s more to do. Our next step is to create even more geolocated and persistent experiences, like what we built for Heather’s AR installation in Menlo Park. Further ahead, we’re exploring how to combine the power of deep neural networks and Caffe2 to create more complete SLAM maps, handle dynamic objects, add semantic information, and create persistent AR experiences deeply integrated with the Facebook ecosystem. We’re excited to dive deeper into these concepts and will keep you updated on our progress.